they fight, and I gotta separate them. but it doesnt like pebbles. maybe cos pebbles a guy and mee mee's a girl. now they are separated, and i'm thinking if i should be pebbles a companion.it seems lonely too.always looking at me with its cute big eyes. was in a horrible,irritable cranky mood the whole day and was trying hard to restrain.until i had a first bite of yoguru's yoghurt with almond nuts. omg.bliss. i feel sooo happy.the peach flavour of the yoguru's yoghurt has a smashing sensation with the almond nuts. 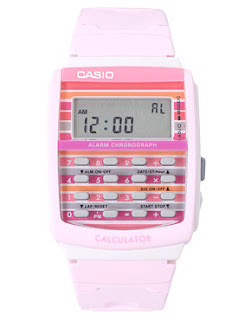 and i bought this super cute pink casio calculator watch.isn't it darn cute!